No this isn’t a passageway for jerks. 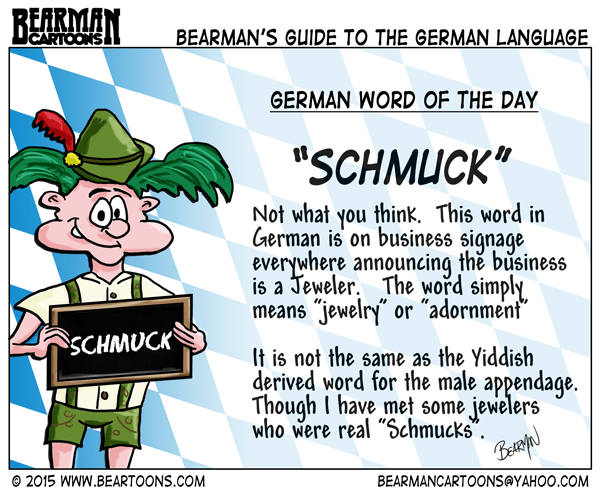 Schmuck in German means “jewelry” or “adornment” so some variation of it is used on signage by Jewelers. This is not to be confused with the same word derived from Yiddish that means a “foolish or contemptible person” or literally the word for a male appendage. I prefer the yiddish version ! After reading these German word cartoons, I’ll bet I would have a blast in Germany! I think Yiddish has a greater meaning. Calling someone a piece of jewelry doesn’t carry the same impact. damn made me look it up. Being German, I love this series! this has me wondering if Germany has a place were their crown jewels are kept, like the UK. I wonder if this is a comment on what someone thought of jewelers. I learned this word when playing the German game “Stone Age” The add on edition comes with extra pieces and some of them are jewelry. 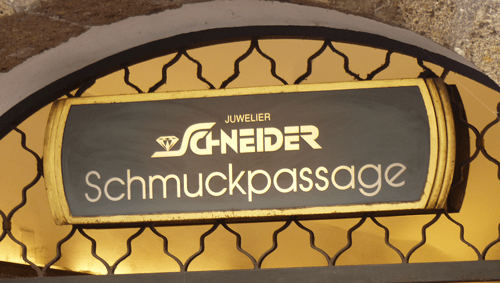 All I heard though was shmuck.